JetBlue Airways is expanding its Mint premium-class service to seven additional U.S. transcontinental routes. 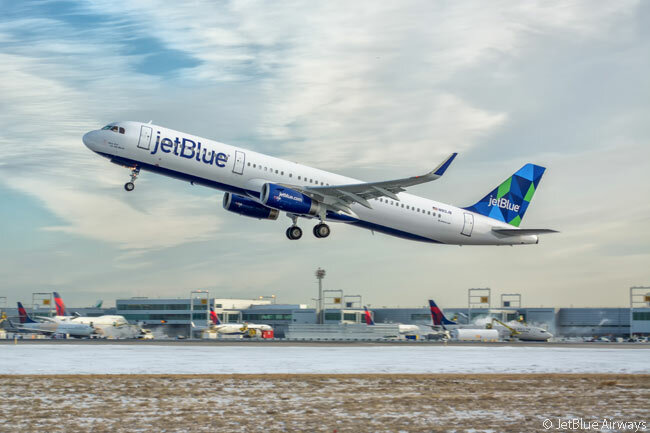 JetBlue operates all its Mint services with Airbus A321s, which are outfitted to provide JetBlue’s reinvented ‘Core’ in-flight experience for every passenger on the flight. “Our plan has long called for strategic growth of Mint on these valuable transcontinental routes, and now is the right time for us to capture this opportunity to bring much needed competition where customers are facing dwindling choices,” says Robin Hayes, president and chief executive officer of JetBlue Airways. The new Mint cities have strong demand for premium-class travel, according to JetBlue. It will begin launching its new Mint routes in the first quarter of 2017 and planned Mint-service route launches will continue into 2018. JetBlue will introduce its Mint service to routes linking Fort Lauderdale Hollywood International Airport with Los Angeles International Airport and San Francisco International Airport. It will also launch Mint service on routes linking New York JFK, its largest hub, with Las Vegas McCarran International Airport, San Diego International Airport and Seattle-Tacoma International Airport. JetBlue will also introduce Mint service on routes linking Boston Logan International Airport, its second-largest hub, with San Diego International Airport and Seattle-Tacoma International Airport. Seats for new Mint routes will become available for booking in the coming months, according to JetBlue. JetBlue will take delivery of nine A321s with cabins configured for Mint premium-class service in 2017 and plans to take additional Mint-configured A321s in 2018. 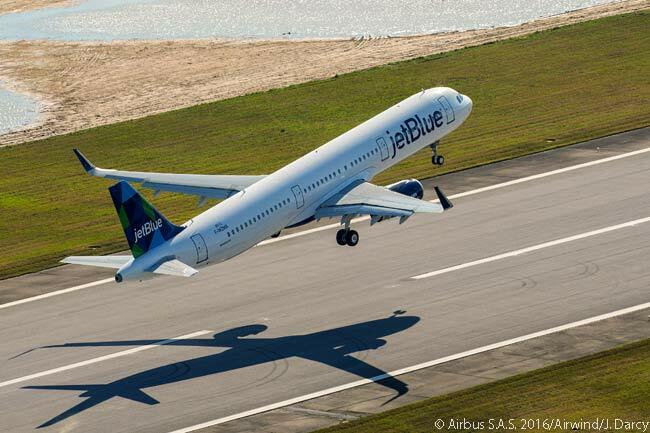 Since the first aircraft delivered by Airbus from its new U.S. final-assembly line for A320-family jets at Mobile in Alabama will be an A321 for JetBlue, to be delivered on April 25, it appears likely all of JetBlue’s 2017 and 2018 Mint-configured A321 deliveries will also be assembled on the Mobile final-assembly line. 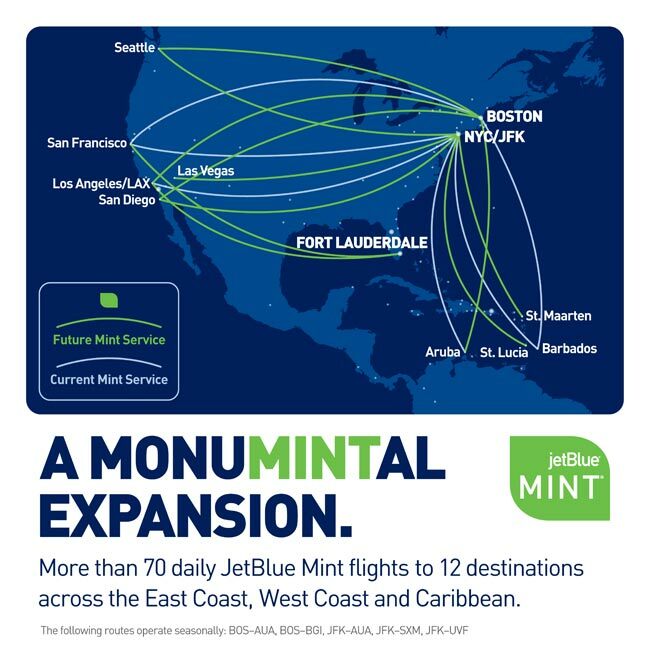 JetBlue has already expanded its Mint route network as a result of the service’s early popularity on the initial routes it was offereed, those linking New York JFK with Los Angeles and San Francisco. It recently launched Mint service from Boston Logan and is growing both seasonal and year-round Mint service in the Caribbean, with flights to Barbados, Aruba, St. Lucia and St. Maarten.